It is very hard to remove stains from one clothes. Before removing the stains from the clothes one should know the correct procedure to remove it. There are different types of stains and there are different procedures to remove each type of stains. Here are different ways on how to effectively remove stains on your clothes. 1. Tea Stains: If your clothes have tea stains then you should soak the stained part of your clothes in a concoction of heavily sugared water for several minutes and then launder it as usual. 2. Red Wine Stains: If your clothes have the stain of red wine then you should immediately sprinkle some baking soda on it if the stain is fresh. Next, you should stretch the stained part of a fabric over a kettle or a bowl and secure the fabric over it and then pour the boiling water through the stained part. 3. Ink Stains: If your clothes have the stains of the ink then you should soak the inked portion of the clothes with the rubbing alcohol and then wipe it away with a clean cloth. 4. Oil Stains: You can remove the oil stains from your clothes by simply washing it with some shampoo. 5. Grease Spots: If the clothes which you are using as a napkin in your house then it is so obvious that it will have some grease spots on it. To remove the grease spots you just need to sprinkle some cornstarch over the spots. You should leave the cornstarch on it for some time and then brush it off. 6. Lipstick Stains: If you are a lady then it is so obvious that your clothes or your handkerchief will have lipstick stains on it. If you want to remove lipstick stains from a dark fabric then you should take a piece of white bread and remove its crust and then rub it gently over the stained part until the lipstick stains are been removed. 7. Collar Stains: You can remove the stains from your color by just using some shampoo. You should pour some shampoo over the stain and rub it to remove the stain and then launder it as usual. 8. 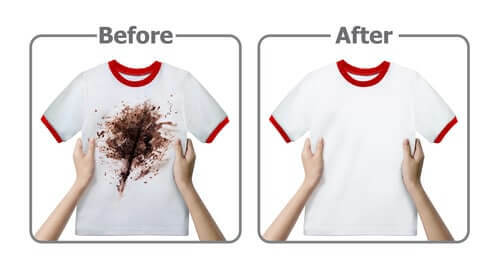 Blood Stains: To remove the blood stains from your clothes you just need to soak the stained part of your clothes in the hydrogen peroxide solution. You should loosen up and scrape away the blood by using the blade of a butter knife or simply by your fingernail.